In what will hopefully be a hot dry summer, the chore of watering the garden becomes significant. This is the time when ‘drought resistant’ plants are recommended as the ideal labour-free solution. However, come the long wet winter some of these plants just look miserable while others may die. The trick is to find plants that have a good degree of drought tolerance, but which also accommodate well to periods of cold and damp. You may need to prepare your soil. Heavy clay soils hold excessive water and are unsuitable for drought resistant plants unless lightened by incorporating organic material such as compost and also gravel. If you have a really free-draining soil, one which is sandy or gravelly, it will be low in nutrients and likewise needs to be enriched with organic material. The following is a suggestion for a rather simple informal planting that includes waving grasses. The colours are mainly pink, purple, blue and silver. In winter many plants will be cut hard back, but the grasses and some evergreens will remain for winter interest. First, the dry garden classic, the sedums. Sedums have fleshy foliage and domed heads of flowers in late summer, these eventually turn brown but remain a feature during winter A number of sedums can be scattered casually through the planting to provide a framework. Try plants such as Sedum spectabile or one of its forms, or the plum-purple foliage of Sedum telephium Atropurpureum Group ‘Purple Emperor’. Next spread clumps of grasses throughout. 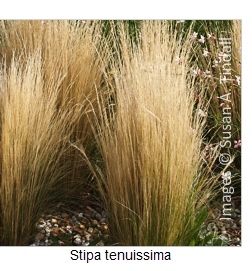 The hair-like bleached foliage of Stipa tenuissima is always lovely as is the beautiful and more substantial, colour-changing Stipa arundinacea. Include a clump or two of a resilient large Geranium x oxonianum form such as Geranium x oxonianum ‘Trevor’s White’ or the hearty spiky-looking purple flowers of Geranium x oxonianum f. thurstonianum or it’s variants. This plant can clamber and even climb through others to attractive effect so it can be placed behind other species. In extremis, hack these geraniums hard back and they will swiftly recover. Taller plants can now be added to your planting to provide drama and interest. Consider some enticing blues such as the globular flowers of tall Echinops ritro and its kind, or for drama, the blue flowers and spiky silver foliage of eryngiums such as Eryngium x zabelii ‘Big Blue’. In the foreground you could include the chunky little Eryngium planum ‘Blue Hobbit’. Russian sage is not only drought tolerant but its foliage can have an appealing, ghostly presence in winter. Try Perovskia atriplicifolia ‘Blue Spire’. Phlomis are another classic for inclusion in drought tolerant planting. The furry leaves and pale lilac flowers of gentle evergreen Phlomis italica are beautiful. Prune this ruthlessly to keep within the allocated area or it will sprawl. Another interesting form is Phlomis tuberosa and its varieties such as Phlomis tuberosa ‘Bronze Flamingo’ which makes a carpet of foliage from which arise long flowering spikes whorled with lilac blooms. Finally there are two very tall possibilities, evergreen Phygelius x rectus ‘Devil’s Tears’ with its tubular pink-red flowers that give an exotic touch. Tall fennels have delicate, frothy foliage and delicate domed heads of yellow flowers. The bronzed-brown Foeniculum vulgare ‘Purpureum’ would sit well behind silver eryngiums. There are other possibilities and you may enjoy supplementing the basic planting over the following years to increase its interest. It is worth seeking out professionally planted dry gardens for excitement and inspiration. Two good examples, both in Essex, are the Beth Chatto Gardens and the Royal Horticultural Society Garden.